Sometime inspiration will jump out and grab you like a sticky handed sasquatch, squeezing you until you fart. Other times it’s more like looking at tadpoles in a septic tank – fruitless and smelly. You need to be open to it, all the time. Also some of the very best ideas seem really boring and usual at first glance. The mundane stuff we all do like go to the toilet, eat breakfast, do homework, paint the cat… all that stuff has lots of funny quirks about it. We all do it slightly differently and I find the little differences can be a source of so much good writing. But you can’t just sit around writing about eating breakfast all day (well maybe you can, and if you can I would sure like to read THAT book) so what I like to do is mix it up. Like in Jimmy Cook Discovers X Marks the Spot. It’s a mix of crazy stuff like: building a robot, hunting for treasure, pirates who don’t use email and then I mix it with the usual stuff like trying to teach a baby Morse Code. When you mix up the real world and the wildest ideas you end up in a pretty cool place. Some people say, “No idea is a bad idea.” But that’s not really true. There are lots of BAD IDEAS (eating a swarm of bees for example) but the trick with BAD IDEAS is not to throw them out but use them as a little step ladder to something even better. To me writing is a lot like working with clay you start out to make a vase and you end up with a gargoyle eating hot chips. 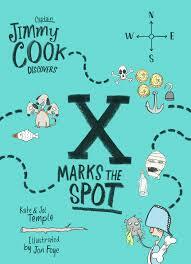 For our review of Captain Jimmy Cook Discovers X Marks the Spot visit, here.